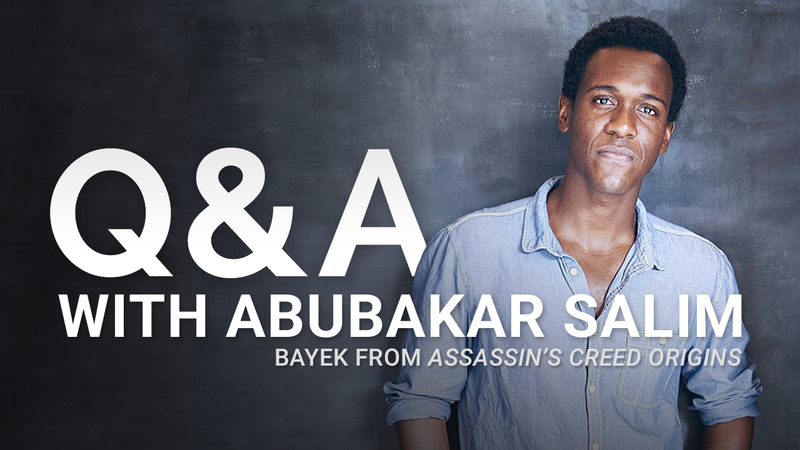 To celebrate our Three Year Anniversary, we sat down with Abubakar Salim, Bayek from Assassin's Creed Origins! Col: Hey Abu, thanks for joining us! Before we start the Q&A, could you tell us a bit about your work for Assassin’s Creed? Abubakar: Thank you! In Assassin’s Creed: Origins, I play Bayek, the last Medjay from Siwa...But I’ll be honest though, my work consisted of me waking up in the early hours, wearing a lycra/velcro suit with reflective balls and voicing and pretending to be a badass for hours. THAT has been my work on Assassin’s Creed so far. ​Col: How did you find Voice Acting, and did you enjoy the experience? Abubakar: I loved every second of it. This is my first video game job and the experience as a whole was a mixture of liberating, exciting, tough and genuinely fun. The passion and love from the team is so strong, that the work environment was a joy to be a part of. Voice acting in a video game? And that game being Assassins Creed?! What’s not to love. Col: When you auditioned for the role, did you know it was for a video game? Abubakar: No I didn’t! The character had a different name, and it was advertised as an animated series which would require motion capture. I got the audition through my acting agent, and I remember thinking that this would be an interesting project to get involved in. On my second round however, I met the creative team and they dropped the bomb that it was Assassin’s Creed, and I can just remember this feeling of pure elation. I’m a gamer and a huge fan of the series in particular, so my inner child screamed with joy when they mentioned that it was for the new Assassins Creed game. I had to play it cool though...well, I’d like to think I played it cool. But I’m sure Kama (animation director) and Felix (cinematic director) would tell you very different. Col: Was voice acting something you ever considered when you first started your career? Abubakar: Absolutely. It’s all creative man, and as I said before, video games to me as a kid was and still is a huge part of my life. I didn’t watch many films or TV shows, and books were hard to digest due to my dyslexia, but with video games and the beautiful worlds and stories crafted by them, it became the gateway into my imagination which fuels my work. If I could move, inspire, make someone feel what I felt as a kid when I dived into these worlds, then I’m happy. Col: How would you describe Bayek to a friend? Abubakar: He’s seen things. Smells though...don’t think he washes much. Col: As a Medjay (Ancient Line of Warriors), Bayek cares deeply about the people of Egypt. Do you think players will get a sense of Bayek’s sympathy and compassion for other people in the game? Abubakar: For sure. There is a form of duty that the Medjay held back then and Bayek has such a passion for justice and the people of Egypt, that I feel the players would connect with him on that level. But without going into too much detail, there is an incredibly powerful drive to Bayek which when the players find out why, would make the players understand why he cares so much. Col: Ashraf Ismail (Game Director on ACO) said in an interview with Gaming Bolt that Bayek “is the physical embodiment of ancient Egypt”. Do you agree with this? Abubakar: To me, Bayek is a man like you or me who happens to be in Ancient Egypt, and because of the given circumstances, his reactions become crucial to the shifts and changes of that time. He is definitely the embodiment and voice of a side of Ancient Egypt, but I feel that with this game, each character represents a part of Egypt which is as important as each other. Col: What can you tell us about the relationship between Bayek and Senu? Abubakar: Oh man. All I can say is that, that bond is special. Very special. I don’t want to reveal too much, but you will learn why when the game comes out. Col: Have you ever been to Egypt? Abubakar: Yes as a child with my parents. I don’t remember much, but I do remember taking my YuGiOh cards expecting to duel any fool brave enough to challenge me. Fortunately for them, it didn’t happen. Col: Have you seen much of the Assassin’s Creed Origins Fan Art/Cosplay Projects. If so, is there a specific piece that sticks in mind? Abubakar: So since the announcement, there has been so much incredible pieces of work from the fans and the community that I can’t wait for all the more stuff that is to come when more gets revealed! Honestly, each person’s touch and addition to the franchise, be it through cosplay, art work, comic or fan fiction, has been joyous to witness. ​Col: What are you most excited about for when the game drops on the 27th October? I’m looking forward to get playing it finally. But I am super excited for the journey that the players are going to be taken on. Blood, sweat and tears have been poured into this beast of a game and to finally share that with the world will be a beautiful moment. We would like to say a huge thank you to Abubakar Salim for joining us, and to everyone at Ubisoft who helped to make this interview possible. Assassin's Creed Origins releases on the 27th October 2017.